Our Versailles Triple Dresser proudly possesses the distinct, pure beauty only found in an authentic American premium hardwood. While the unique character and beautiful grain of the hardwood add an unrivaled beauty, dovetailed drawers finished back and bottom with full-extension soft-close drawer slides add practical convenience. Beveled glass on an easy-mount mirror completes the piece, as craftsmen also sign and date each dresser to underscore its quality and authenticity. Three concealed top drawers add an extra benefit to create a final dresser of unparalleled heirloom quality. 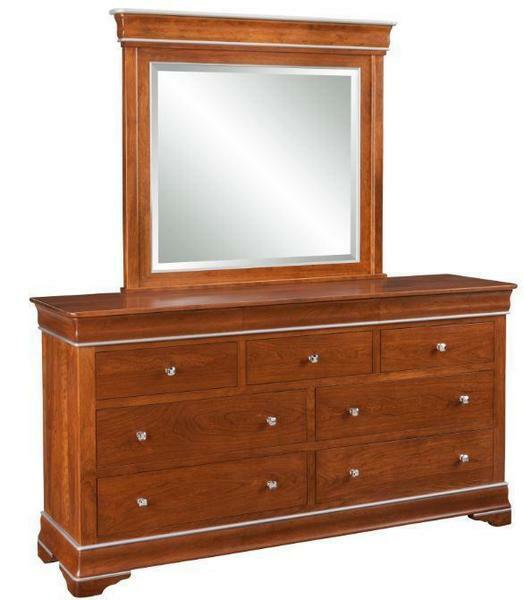 This dresser is backed by the Keystone Lifetime Guarantee! Please call to speak with an Amish furniture specialist for more information: 866-272-6773. Height: 30" or 42 1/2"